The time has come when everybody is jet setting around the globe, going on summer vacation, holidaying with friends, and visiting family. 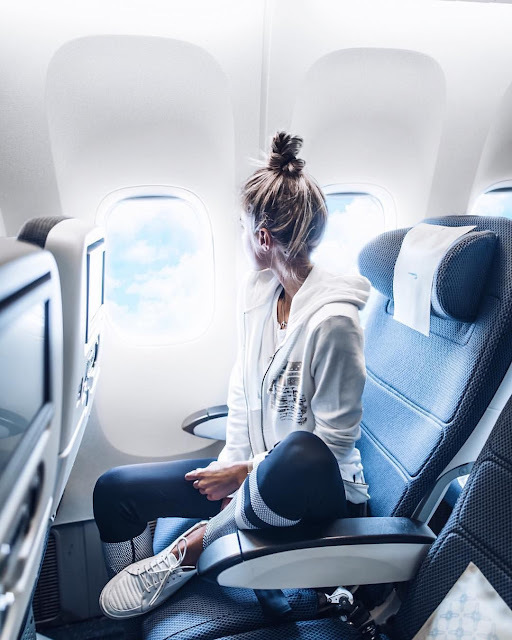 Although exciting, traveling can often take its toll on us, so here's a guide to how to make air travel both easy and stylish, no matter where you're headed! Less is definitely more when it comes to colours when travelling. Keep it simple with a monochrome palette and toned-back colors to keep you comfortable and calm, like Karlie. Making sure that you'll be comfortable walking around the airport, easily sitting and standing up, and not having any hard materials digging into you is key to comfortable travelling. Take notes from Bella Hadid and opt for a simple yet stylish co-ord loungewear set in a loose fit for maximum comfort. Taking off and putting on shoes in airport security is a notoriously laborious process. Why not make it that much simpler and invest in a cute pair of slip-on shoes that make the security-faff a bit easier to navigate? Try these affordable cuties from ASOS. Whether you're traveling from a hot climate to a cold climate, vice versa, or anywhere in between, it's always a good idea to have many layers you can take on and off throughout your journey. The plane cabin can often get very cold, so having a sweater you can throw over your legs will definitely come in handy. If you're stuck for inspiration, make sure to stock up on simple pieces and comfortable basics from Missguided's very own Airport Outfits section and pair them with good-quality statement pieces to create your very own signature travel style. Whatever you decide to wear, the most important thing is to make sure that it's comfortable and breathable. Hopefully, by following these pointers, your outfit will be just as fabulous as it is functional! Bon Voyage!